©2005-2015 Whittier Farms. All rights reserved. • Closed for the season. Thanks to all who visited us at the farm or at Farmer's Markets for a great year!. 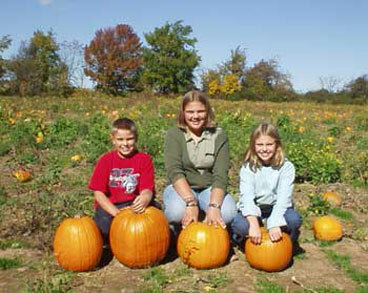 • Whittier Fruit Farm is a short drive from most places in Monroe County, NY. 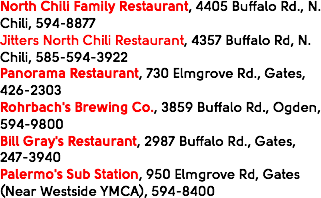 We are located between Spencerport and North Chili and a very short drive from the Rochester Tech Park (formerly Kodak Elmgrove). 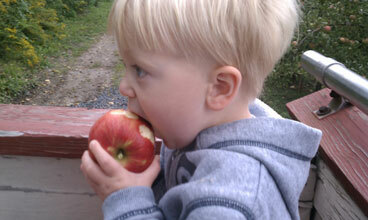 At the Whittier Fruit Farm you can pick 32 varieties of apples on trees that are easy to pick - no ladders necessary! We are always planting new trees, so there are more and more choices each year. 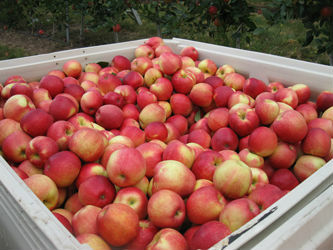 All apples are picked into containers we provide at no additional cost. Our PYO apples are sold by the pound. Check our News section to find out when apple varieties are being picked. Picking time for sweet cherries usually starts late June or July and lasts for two weeks. Check our News section for picking dates. 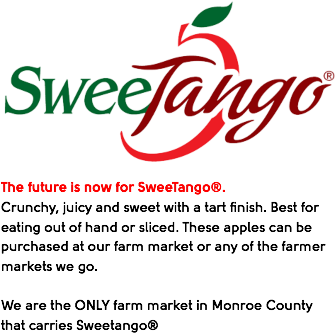 These flat shaped sweet, sweet peaches are sometimes called peentos. They are usually available to pick for 2-3 weeks in August. Check our News section for picking dates. 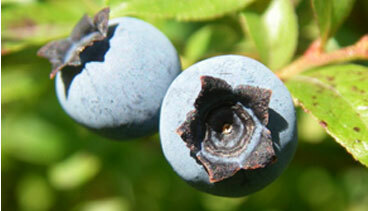 Our blueberries are located along Lake Ontario in Niagara County. Blueberries season runs from mid-July to early September. Check our Blueberries section for directions to the blueberry patch. Paula Red, Zestar, Sansa, Ginger Gold, Jonamac, SweeTango, CrimsonCrisp, Gala, Twenty Ounce, AutumnCrisp, McIntosh, Honeycrisp, Cortland, Sweet Sixteen, SnapDragon, Fireside, Empire, Fuji, Macoun, SnowSweet, Red Delicious, Fortune, Jonagold, Golden Delicious, Topaz, Ida Red, Northern Spy, Crispin, RubyFrost, Suncrisp, Granny Smith, and Cameo. Check our News section for picking dates. Long Pond Rd. near Ridge Rd. 2200 Westside Dr. at Buffalo Rd. Blueberry season runs from mid-July to early September. Paul, Marketplace, Pittsford and Geneseo stores. To get to the blueberry field from the Rochester area, give yourself about an hour. Take Route 390 north to the Lake Ontario State Parkway and drive west until the parkway ends. Turn right (west) on Route 18 and continue for about 20 miles, half a mile beyond the power plant. Look for a sign on the right that says "Russell's U-Pick Blueberries." See Directions section for a map. Since our farm is on the near edge of the Rochester NY metropolitan area, we see part of our mission is to communicate the vital role of agriculture to children, teachers and parents. A visit to our farm with your class will get your children “down to earth” very quickly. Each group has its own farmer guide to take the children into the apple orchards or to the pumpkin patch to learn how apples and pumpkins grow. And the kids gets to enjoy a bumpy tractor and wagon ride around the farm. Available times are 9:30, 10:30, and 1:00. Each tour is 45 minutes long. If you have more than 18 pre-school children or 25 elementary grades children, your group will be split into two sections. Fees are $5.00 per child, $2 per adult, no charge for teachers and classroom staff. $50 minimum charge. A $25 non-refundable deposit fee which will be applied to the cost of the tour is required when booking the tour. Everybody has their own pumpkin fantasy and we try hard to have just the pumpkin you are looking for: Tall, Fat, Huge, Small, for jack-o-lanterns, pies and decorations. Our tractor and wagon will take you to the Pumpkin Patch on Saturdays and Sundays in October. Or you can pick one up at our farm market. Our pumpkins are sold by the pound. The Whittier Fruit Farm has been owned and operated by the Russell family since 1974. Ray and Judy Russell quickly replaced the very tall and old apple trees with smaller trees which are ideal for picking. They also added other pick-your-own crops such as blueberries, plums, sweet cherries, and pumpkins. 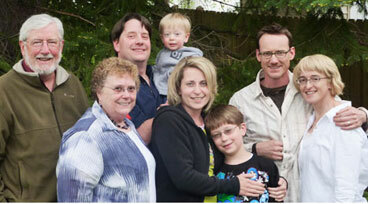 Soon their two sons, Dave and Mark, and their families joined the business. Fresh homegrown fruits and vegetables are available in season at our family-owned and operated farm since 1974. Unlike many fruit farms in the area, we have trees that are just the right height for a "pick your own" farm. You will find 32 different varieties of apples in a fairly compact area. You also can buy apples already picked in our store. 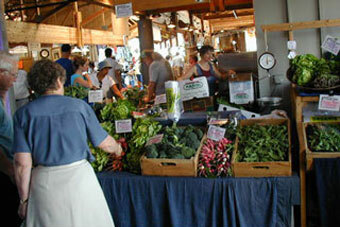 Watch for us at Farmer's Markets and for the farm opening early summer!